There are some new rules you should know about before you head to Walt Disney World for a day at the happiest place on earth. 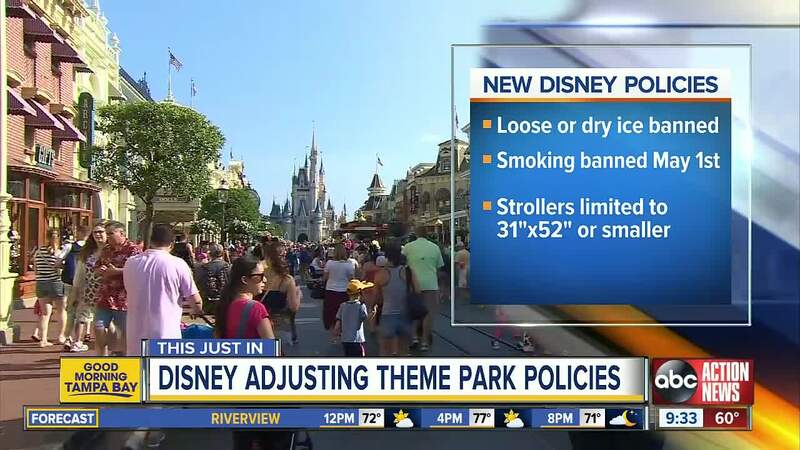 According to the Disney Parks Blog, some new regulations on smoking, strollers, stroller-wagons and loose ice are going into effect starting today and later this year. Beginning May 1, 2019, there will no longer be smoking areas inside of Walt Disney World or Disneyland theme parks, water parks, ESPN Wide World of Sports Complex or Downtown Disney in California. There will be designated smoking areas outside of the entrances of the theme parks and other areas affected. There will also be designated smoking areas outside of Disney Springs in Florida. There are also smoking areas available for guests who have room or dining reservations at Disney Resort hotels. Strollers are very important for a family headed to Disney World for the day. They can serve as a napping area, a way to store all of your stuff and a spot for the little ones to rest their legs while you're making your rounds at the parks. Starting May 1, 2019, the guidelines for stroller sizes are changing and strollers can't be any bigger than 31 inches wide and 52 inches long. Many strollers sold today, even the double jogging strollers, fit within these guidelines. For example, the BOB Revolution Flex stroller is 25.4 inches wide and 43 inches long, and the Revolution Flex Duallie (double stroller) is 30.5 inches wide and 45 inches long. Wagons are not permitted in the parks but as of May 1, 2019, stroller wagons will also no longer be allowed. Disney Parks Blog says this will help ease congestion to make the parks more enjoyable for everyone. And as always, you can rent a single or double stroller during your time at the parks. Beginning March 28, 2019, if you bring a cooler to store snacks and drinks for your day at the parks, loose or dry ice are no longer permitted. Disney Parks Blog suggests keeping your snacks and drinks cool with reusable ice packs instead. You can also visit any Quick-Service location for complimentary cups ice for your cooler. Even better, you can always request complimentary cups of ice water to stay hydrated while moving through the parks. To learn more about the rules and new regulations, click here.